Sooo, it is that time again where I share with you all the books I have purchased recently! I say recently, I purchased these possibly over a month ago, oops! 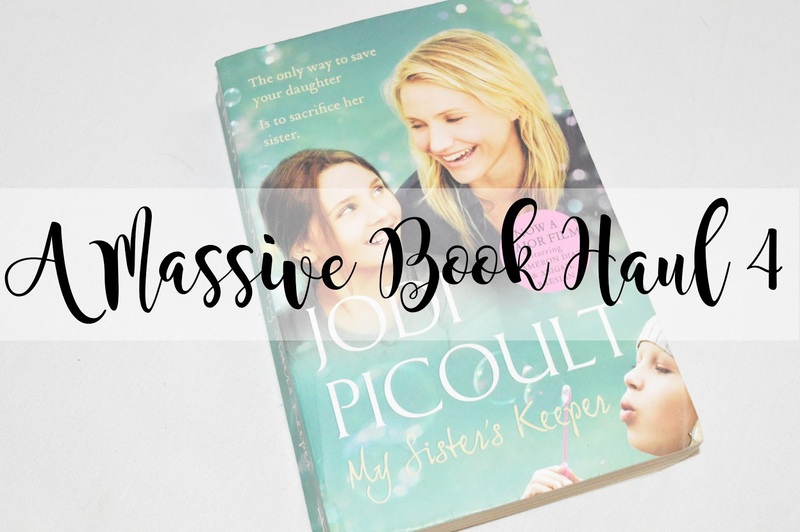 I've come to realise my book hauls are fairly popular and many people are interested in the books I pick up so here is another nine books, mainly by the Author Jodi Picoult. However, we all know she's fab so this doesn't matter! Also, if you're wondering where I purchase my books from; I do not pay £7.99 per book! That would be absolutely insane! I go into every charity shop I find and pick them up for 50p-£1.50 depending which shop I go into, it's great! If you didn't know already, I absolutely love Katie Flynn, she is an incredible Author and her books are always a wrench to put down again! Her books usually include something rather heartwarming of either love or loss but they're always absolutely incredible! If you haven't ever read any of Katie's books before then I highly recommend them and possibly give this one a try too! I can see it being a very good read and one which I won't want to stop reading until it's finished. I absolutely love when Katie brings out Christmas books, I feel like they bring more of a heartwarming story and Holyhead and Anglesey Mail expresses "If you pick up a Katie Flynn book it's going to be a wrench to put it down again" and I completely agree! You will love Katie's books and I've very excited to read this one! "Addy and Prue Fairweather live with Nell, their widowed mother, in a flat above her shop on the Scotland Road. The sisters, however, they are different. Addy is dark haired, plain and always in trouble, whereas Prue is flaxen hared, blue eyes and as angelic as her looks imply. To make matters worse, Nell makes no secret of her preference for the younger girl, increasing Addy's jealousy and resentment. On the other side of the coin, Giles Frobisher and his twin sister, Gillian, live in a crumbling mansion near the sea in Devon. The family have lost most of their money in the Depression, so Giles leaves university and joins the Fleet Air Arm. He meets the Fairweather girls briefly on a visit to Liverpool but they lose touch. When they meet again Addy and Prue are no longer children and Giles realises he is falling in love." Oops, another Katie Flynn book! If you haven't ever read Katie's books, I really recommend them! They're not the traditional 21st century book, and they're based in a variety of different years but I love the way she writes! Katie never fails to amaze me. As the Choice expresses "Katie Flynn's Liverpool Sagas are fine examples of historical storytelling." "Claudia Muldoon and her younger sister, Jenny, live with their parents and their gran in her house in Blodwen Street. Both parents have good jobs and the family assume they are settled for life, but then Grandpa Muldoon has a seizure and begs his son t return to Ireland and the family croft. The Muldoon's leave and Gran has to take in lodgers to make ends meet, for the depression is beginning to bite. In Ireland, however, the Muldoon's flourish and the girls love the freedom of their new life, though as they grow up, disadvantages become clear. Claudia has to find work, so both sisters return to Liverpool and to their old pal Danny, who still adores the beautiful Claudia and welcomes them back with delight. But both girls' lives take an unexpected turn when Danny's friend, the flamboyant and successful Rob Dingle, returns from America." I don't really need to say much about this book. My Sisters Keeper is a beautiful, emotional, heart wrenching film and definitely one to make you cry for hours! I was so excited to find out that it's actually a book by Jodi Picoult. One of my favourite films & one of my favourite Authors, who would have known? If you haven't watched this film, I highly recommend it but make sure you have tissues to hand! If you haven't read this, me neither! So, let's read it together! "A compelling Emotional drama of love and guilt that grips from the very first moments. Luke Warren would sleep in the dirt if it meant he could be under the stars. He lives by the laws of nature, and would surely want to die that way. But Luke is in a coma and his family must make an unbearable decision. As tensions and secrets rise to the surface, the tragic accident which brought them back together against the odds could well tears Luke's family apart forever. They know Luke would not want to live like this, but how can they choose to let him die?" I haven't read this and I have no idea what happened to Luke which left him in a Coma but I know it's going to leave my in tears! I lost my bestfriend nearly two years ago as his family had to choose to turn off his life support machine. Knowing that this book could be a very similar situation, it's going to be emotional, and a terrific page-turner, but that's what I love in a book! Jodi Picoult is a beautiful writer, and possibly one of my favourite Authors too. I love the sound of this book as they describe it as a "An edge of your seat thriller", which is a book I will always enjoy. You were hurt as a child, now you fear for your daughter, what would you do? And the question here is, what would you do? Honestly? I'd probably escape to somewhere where they'll never find me or my daughter. Wouldn't you? "The first time Jane Jones tried to leave her husband, her daughter almost got killed. This time, she's going to do it right. Jane escaped a childhood of abuse into the refuge of marriage, only to find history repeating itself. And when her husband's neglect extends to their daughter too, she knows it must stop. Taking Rebecca with her, Jane runs away, seeking the only place of safety she knows. But however far she runs, she cannot escape the question always on her mind; how can she save her daughter, when she couldn't save herself?" "A shocking murder shatters the picturesque calm of Pennsylvania's Amish Country - and tests the heart and soul of the Laywer who steps in to defend the young woman at the centre of the storm." I found the story line of this book very intriguing as it's about a psychological drama, while also including the story line of a courtroom. I absolutely love anything which involves psychology and lawyers so this was a real winner for me! I feel like I could really relate to this book in some way, I don't believe in God, but I also don't have a daughter, but I guess it'll help me in the future if my daughter starts talking to angels! I love books which are fascinating and engrossing, a story which is really going to pull me in and bring out my emotions! I believe this is going to be one of them books. "When Mariah White catches her husband with another woman, her life starts to fall apart. And when her daughter, Faith, begins to confide in an imaginary friend, her own brush with insanity starts to take on a darker meaning. Then faith appears to start performing miracles, and all at once the situation is spiralling beyond Mariah's Control. Is faith truly seeing God? Or if she just a trouble little girl seeking refuge from her parents' divorce? When it comes to matters of faith, it's hard to know who to believe. Jenny Colgan is another one of my favourite Authors, I find her writing absolutely brilliant and her stories never fail to make me smile. I realised I didn't have this book in my collection so I couldn't help but pick it up for only £1 at a Charity Shop, bargain! This book is definitely going to be a heart warming, witty and very funny novel! "They may be twin sisters, but Lizzie and Penny Berry are complete opposites- Penny is blonde, thin and outrageous; Lizzie is quiet, thoughtful and definitely not thin. The one trait they do share is a desire to DO something with their lives, and as far as they are concerned the place to get noticed is London. Out of the blue they discover they have a grandmother living in Chelsea - and when she has go to into hospital, they find themselves flat-sitting on the King's Road. But, as they discover, it's not as easy to become It Girls as they'd imagined, and West End Boys aren't at all like Hugh Grant." I hope you enjoyed another book haul! Let me know if you have read any of the books mentioned above. Who's your favourite Author? let me know! I need to try Katie Flynn, I love Jodi Picoult. 'Y sisters keeper is good but different from the film! Jodi Picoult is such an amazing author. You are in for a few twists and turns with My sister's Keeper.